October, 2017 - The Texas Trustee Implementation Group (TIG) has released its first restoration plan, selecting 13 restoration projects to compensate for injuries to natural resources caused by the Deepwater Horizon oil spill. The Texas Trustee Implementation Group Final 2017 Restoration Plan and Environmental Assessment: Restoration of Wetlands, Coastal, and Nearshore Habitats; and Oysters was published on October 18, 2017 and prioritizes restoration projects for oysters and wetlands, coastal, and nearshore habitats with a total estimated cost of $45,761,000. The final restoration plan reflects revisions to the draft plan resulting from public comments and continuing project development by the Texas TIG. View the restoration plan. 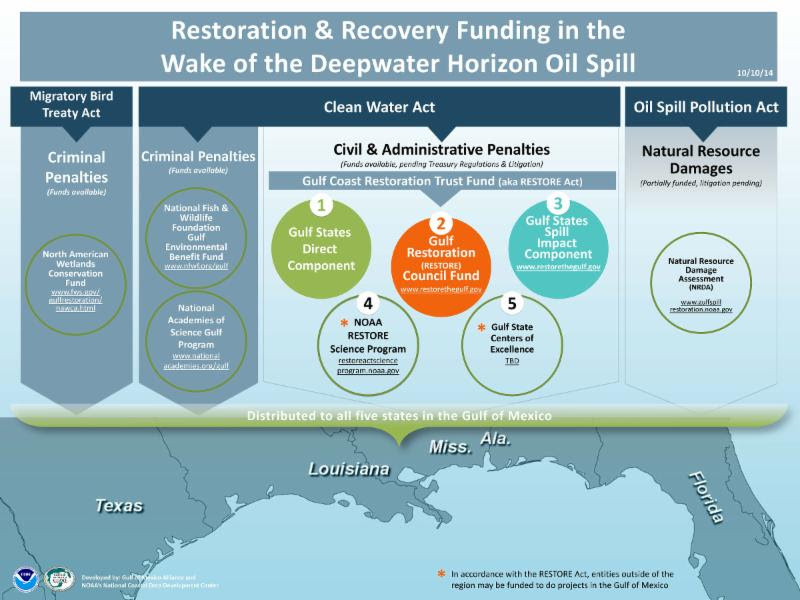 The Gulf Coast Ecosystem Restoration Council approved a Funded Priorities List (FPL) this week, which will determine environmental projects and activities that are to receive the first round of funding from the 2010 Deepwater Horizon spill civil penalties. The projects on the FPL were selected based on their ability to create a base that future projects can build on, restore the Gulf Coast region’s environmental health and promote its ecosystems and economy. Listed projects include both those that will impact the ecosystem in the near future as well as planning activities. The council was created by the federal RESTORE Act (Revived Economies of the Gulf Coast Act of 2012), and the FPL marks its first allocation of funds from the Gulf Coast Restoration Trust Fund toward environmental projects. On Tuesday, November 10th the National Fish and Wildlife Foundation (NFWF) announced the award of more than $80 million from its Gulf Environmental Benefit Fund (GEBF). The funding will go toward 22 projects in the states of Alabama, Florida, Mississippi and Texas. This is the third round of grants from the Gulf Environmental Benefit Fund (GEBF). Read NFWF's full story. Read Alabama Governor Robert Bentley's full announcement. Read Mississippi Governor Phil Bryant's full announcement. The State of Louisiana works with NFWF via the Louisiana Coastal Protection and Restoration Authority (CPRA). CPRA is working to address the goals of the Louisiana comprehensive Coastal Master Plan. Read more about how CPRA and NFWF will address these unique coastal restoration needs. Each Gulf State works with NFWF to solicit and select projects for funding. Go to NFWF's Gulf Environmental Benefit Fund webpage and click on the interactive map for how your state implements this funding opportunity.